Self-compacting concrete (SCC) is a mixture of flowing concrete which is able to compact or consolidate by its own weight. 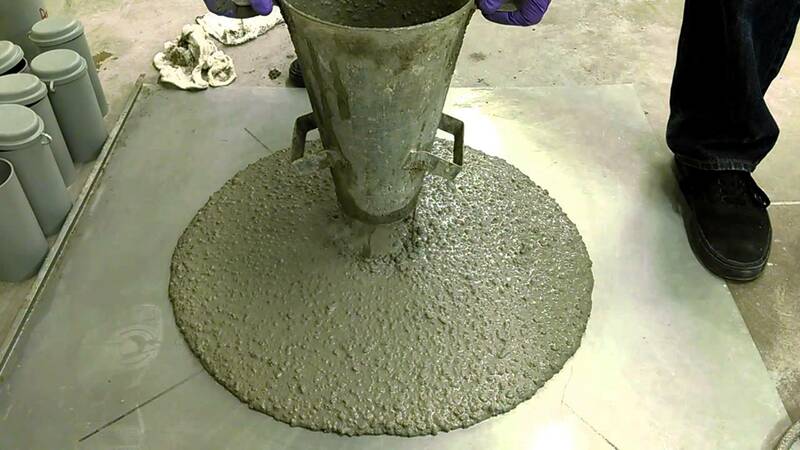 The flow able fluid nature of Self-compacting concrete makes it a good choice for placing concrete in difficult or under challenging conditions and in sections with congested and narrow spaced reinforcement. Use of self-compacting concrete can also help minimize hearing-related damages on the construction site that are produced by the vibration of concrete and Another advantage of Self-compacting concrete is that the time required to place large concrete sections is considerably reduced. This concept arose when the construction industry in Japan was suffering decline in the availability of skilled labor in the 1980s, a need was felt for concrete that has the self-compacting nature to overcome the problems of defective workmanship. This guided them to develop a self-compacting concrete, primarily through the work by Okamura. A Team was formed to study the properties of self-compacting concrete, which was led by Ozawa at the University of Tokyo. The first self-compacting concrete was produced in 1988 and was named “High-Performance Concrete”, and later on called as “Self-Compacting Concrete”. Self-compacting concrete has material requirements which are same as normal/ordinary concrete, but it requires admixtures to improve its work ability. All cement type conforming to EN 197 can be used. Selection of the type of cement will depend on the requirements of concrete parameters such as strength, durability etc., and C3A content higher than 10% may cause problems of poor workability. The range of cement is between 350-450 Kg /m3 and if used more than 500 Kg/m3, it can be dangerous and can increase the shrinkage. All normal concreting sands are suitable for SCC. Either crushed or rounded sands can be used. The amount of fines less than 0.125 mm is to be considered as a powder. It is very important for a good chemical mixture of concrete. All types of aggregate with the normal maximum size is between 16 – 20 mm are used. 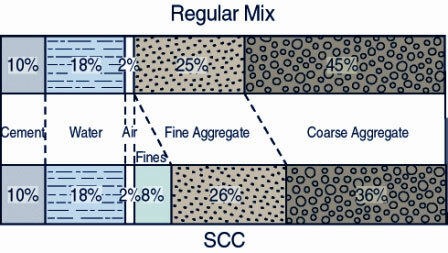 However, particle size up to 40 mm more have been used in SCC. Among the different types of aggregate, crushed aggregate offers good strength improvement but rounded aggregates improve the flow capacity because of lower internal friction. The most important admixture in self-compacting concretes are the super plasticizes (high range water reducers), which is used with a water reduction greater than 20%. The addition of viscosity Modifying Agent (VMA) gives more possibilities of controlling segregation when the amount of powder is limited. The method for producing self-compatibility involves not only high deform ability of paste or mortar but also resistance to segregation between coarse aggregate and mortar when the concrete flows through the narrow- confined zone of reinforcing bars. Okamura and Ozawa have employed the following methods to achieve self-compacting concrete. The frequency of collision and contact between aggregate particles can increase as the relative distance between the particles decreases and the internal stress can increase when concrete is deformed. Research has found that the energy required for flowing is consumed by the increased internal stress, resulting in blockage of aggregate particles. To avoid this kind of blockage, limiting the coarse aggregate content, whose energy consumption is particularly intense to a level lower than normal. The highly viscous paste is also required to avoid the blockage of the coarse aggregate when concrete flows through obstacles. High deform ability can be achieved by the employment of a superplasticizer, keeping the water-powder ratio to a very low value. 01. After producing the self-compacting concrete, it is required to have the qualities like high-flowability, resistance against segregation and possibility (an ability that is necessary to pass the space between reinforcing bars. 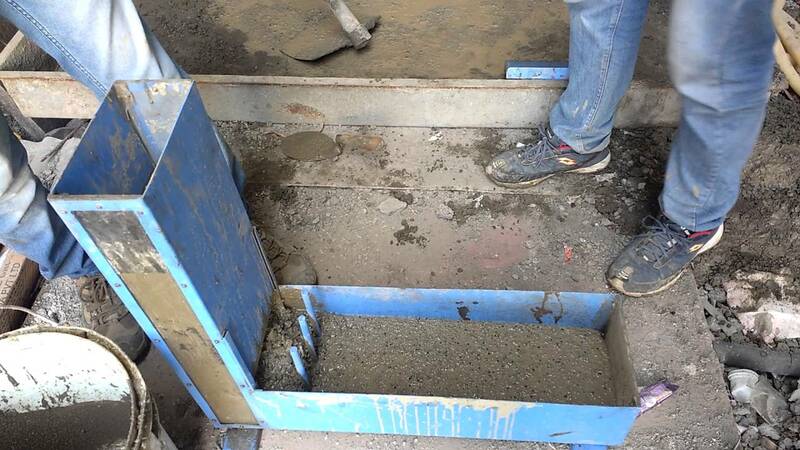 Therefore, it is essential to test whether the concrete is self-compactable or not and also to measure the deformability or viscosity for estimating proper mix proportioning and if the concrete does not have sufficient self compatibility. The trail mixes are repeated to get an appropriate mix for self-compacting concrete. Also Read: What is Concrete Mix Design (CMD)? 02. The equipment that is used normally for conventional Slump test, shall be used. 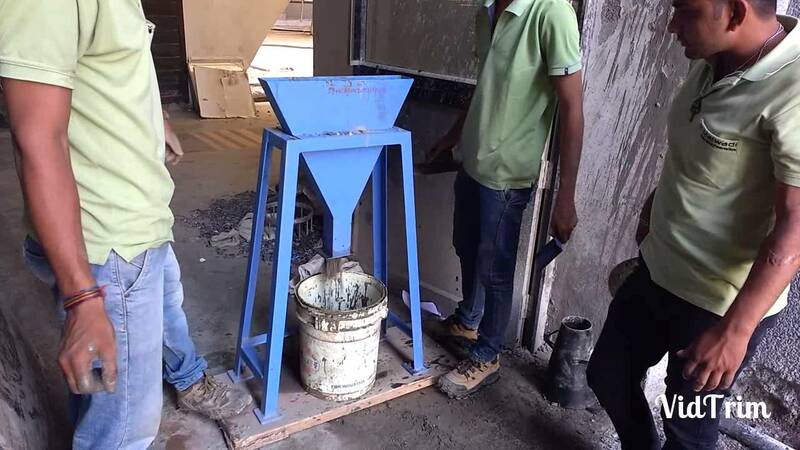 The test method differs from the conventional one in the way that the concrete sample is placed into the mould has no reinforcement rod and when the slump cone is removed the sample collapses. The diameter of the spread of the sample is measured and the horizontal distance is measured as against the vertical slump measured in the conventional test. While measuring the diameter of the spread of concrete, the time that the sample takes to reach a diameter of 500 mm (T50) is also many times measured. The Slump Flow test can give an indication about the filling ability of Self-compacting concrete and an experienced person can also detect an extreme susceptibility of the mix to segregation. The V-funnel test for concrete was developed in Japan and used by Ozawa. The equipment consists of a V-shaped funnel as shown in Figure. The funnel is filled with self-compacting concrete and the time taken by it to flow through the equipment is measured. This test gives information about the filling capacity (flowability). 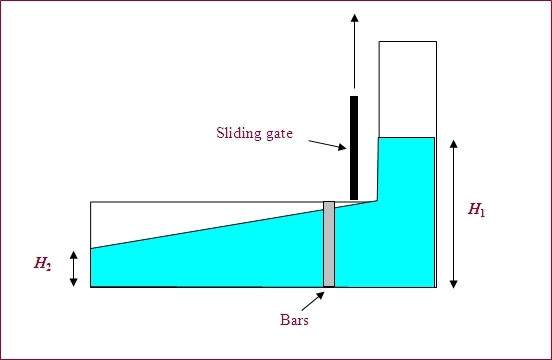 The L-box test method consists of test apparatus comprising a vertical section and a horizontal opening into which the concrete is allowed to flow and on release of a trap opening from the vertical section passing through reinforcing bars placed at the intersection of the two areas of the apparatus. The concrete ends of the apparatus H1 and H2 measures the height of the concrete at both ends. The L-box test gives information about the filling ability and passing ability of concrete. Self-compacting concrete has been used in bridges construction and even on pre-cast sections. One of the most remarkable projects constructed using self-compacting concrete is the Akashi-Kaikyo Suspension Bridge. In this project, the SCC was mixed on-site and pumped through a piping system to the specified point of bridge section, located 200 meters away. On this project, the construction time was reduced from 2.5 years to 2 years. Labour reduction hence cost reduction. Better bond to reinforcing steel with concrete. Accelerates project schedules, hence saves finance later. Minimizes voids on highly reinforced areas, hence better durability. Fast placement without vibration or mechanical consolidation. Lowering noise levels produced by mechanical vibrators. It can be concluded that Self-compacting concrete helps to improve the environment of the construction locations by reducing noise produced in the plants and construction fields and reducing the labour (Reduction manpower) where concrete is being cast. In the other word, the SCC is an ideal type of concrete that can be used for section which have narrow spaced reinforcement and architecturally demanding. It can be used for all structural applications which require higher efforts in order to gain sufficient compaction. What is Compaction of Concrete? In spite of its short history, self-compacting or consolidating concrete has proved itself as a revolutionary step forward in concrete technology. 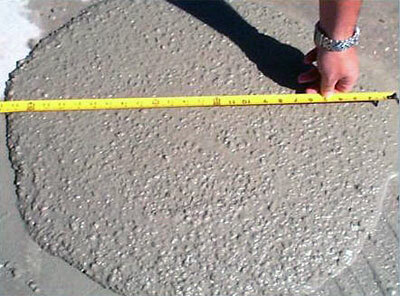 SCC is a relatively new form of concrete which can be used for general applications. The main advantage that self-compacting concrete has over standard concrete is its high compressive strength and self-compacting properties, including high flowability, workability, and passing ability. It thus avoids many limitation of conventional concrete. Previous PostPrevious Kitchen Chimney – All you Need to Know!